Deterioration of performance and difficulty in recovery is an aspect in sports that weighs heavily in athletes’ ability to engage in beneficial physiological adaptation to stress, marking the adaptative process their upper limit of achievement. Since in order for them to achieve high performance they must engage in frequent bouts of strenuous training, the discomfort DOMS (Delayed Onset Muscle Soreness) that irremediably follows subsequent to activity is largely dependent on the magnitude of EIMD (Exercise-induced Muscle Damage) induced inflammatory response. Performance largely depends on how the adaptive process that follows EIMD is managed. DOMS, its manifestation, must be dealt with individually according to each particular subject’s sensibility to exercise, in order that enhancement of performance is favored and maladaptation is avoided. A pattern of the adaptive process has been called Training Adaptation Syndrome and its evolution in time after a training challenge or event can be clearly appreciated form the graph below1. New challenges should not be undertaken until the recovery has lead to reestablishment of the full ability to function. This of course is a time lapse that varies with the individual but which may in some cases exceed 48 hrs. Also, how improvement of performance with training of the athlete and adequate recovery/adaptation is progressively achieved, can also be appreciated in the graphs shown above and below1, leading to the morphological reorganisation of the functional systems that physical exercise puts under stress. Only then higher performance may be mastered. However, despite the extensive literature and investigation on the subject, the process is not well understood. This lack of clear understanding has motivated resorting to empirical methods for management of DOMS which consist mostly in applications of cold and cryotherapy, static compression, intermittent peristaltic compression, massage, nutrution, heat-related treatments, trekking poles, ultrasound and electrical current modalities, hyperoxia or hypoxia, laser therapy, spa therapy, mechanomyographical feedback, vibration therapy, acupuncture, and homeopathy. Almost all are costly and time consuming and among them only massage has shown statistically significant improvement in reducing soreness but shows only limited results in transfer to performance enhancement. In this essay DOMS will be examined and depicted according to the best scientific research that could be found, hoping to give a clearer rendering of what it consists of and seeking a better understanding by athletes, opening perhaps better ways for performance enhancement without the risk of overeaching and falling into maladaptive outcomes. How DOMS affects the adaptation process will be then especially considered. This question cannot be definitely answered, but recent discoveries have given a better idea of what it is in essence. To begin with it remarkably resembles a response to sepsis. Response of muscle to exercise resembles closely to the innate immunity release of alarmins, pro-inflammatory cytokines (e.g., IL-1β, TNFα) and of pro-inflammatory M1 macrophages, in response to sepsis; as shown in the graph above2. Antagonist cytokines at the beginning of resolution (blue) phase will subsequently follow and also the release of soluble cytokine antagonists (e.g., IL-1Ra). Tissue repair at the final phase (green) involves the release of immunomodulatory type 2 cytokines (e.g., IL-10 and TGFβ) and stimulation of tissue resident regulatory T cells (Treg) and M2 macrophages. Potential roles of cytokines (IL-25 and IL-33, IL-6, IL-22), can promote activation of mesenchymal fibro-adipogenic precursor (FAP) cells and immune lymphoid cells (ILCs) to promote tissue repair. Lineage negative (Lin-) cells are selected according to the methods of Ng, Fairchild  for the absence of specific cell surface markers. More specifically in EIMD macrophages and FAPs contribute to effective debris disposal and together with Treg cells they sustain satellite cell proliferation/differentiation and contribute to the resolution of inflammation. However, in some cases the original damaging noxa cannot be removed and maladaptive muscle remodeling takes place with persistent inflammation and recruitment of autoreactive T cells (CD4+/CD8+) ending in substitution of myofibers with noncontractile elements such as fat and fibrotic tissue3. A significant correlation between CRP and a calculated score based on IL-1β and IL-6 levels has been reported during EIMD4. The response to the two cytokines is cooperative or synergistic and the correlation was calculated using normalized values of all patients from all points in time and an appropriate model for the synergistic action of IL-6 and IL-1β as suggested by Ganter et al5. Although EIMD is not generally regarded as an Acute Phase Reaction, the correlated elevation of CRP suggests that it is borderline showing evidence of systemic innate immunity response. EIMD and its manifestation DOMS can be considered as typical aseptic inflammation. Reductions in skeletal muscle function after intermittent-sprint exercise are often proposed to be caused by a range of peripherally-induced factors, including: intra-muscular glycogen depletion; increased muscle and blood metabolites concentrations; altered Ca++ or Na+-K+ pump function; increased skeletal muscle damage; pH decrement; excessive increases in endogenous muscle and core temperatures; and the reduction in circulatory function via reduced blood volume and hypohydration6,7. Though a complex process, as shown above repeated episodic bouts of muscle contraction, associated with frequent exercise training, are potent stimuli for physiological adaptation. Skeletal muscle demonstrates remarkable malleability in functional adaptation and remodeling response to contractile activity over time8,9. Training-induced adaptations are reflected by changes in contractile protein and function10,11, mitochondrial function12, metabolic regulation13, intracellular signaling14, and transcriptional responses15. The molecular mechanisms that govern the adaptation to training, involve a gross gradual alteration in protein content and of enzyme activities. These progressive changes reflect activation and/or repression of specific signaling pathways that regulate transcription and translation, and exercise-responsive gene expression. Transient postexercise changes in gene transcription, early involve genes, myogenic regulators, genes of carbohydrate (CHO) metabolism, lipid mobilization, transport and oxidation, mitochondrial metabolism and oxidative phosphorylation, and transcriptional regulators of gene expression and mitochondrial biogenesis15,16,17,18. A single bout of exercise alters the DNA binding activity of a variety of transcription factors, including MEF219,20, and NRFs21,22. Protein stability and subcellular localization of transcriptional factor complexes within the nucleus and mitochondrion are also affected23,24,25. Moreover, Egan et al. (2013) have recently shown that transient DNA hypomethylation of gene-specific promoter regions precedes increases in mRNA expression in response to acute exercise26. These pulses of elevated mRNA during recovery in turn facilitate the synthesis of respective proteins to elicit gradual structural remodeling and long-term functional adjustments27, which contribute towards maximizing substrate delivery, mitochondrial respiratory capacity, and concratile function during exercise. The net effect is optimal performance during future exercise challenges, with readaptation of homeostasis, or hormesis, characterized by biphasic dose responses of generally similar quantitative features with respect to amplitude and range of the stimulatory response that are either directly induced or the result of compensatory biological processes following an initial disruption in homeostasis28. Adaptation implies altered but optimal metabolic resource allocation and eventually the establishment of an organismal state of enhanced resistance to peripheral fatigue29,30, due to diminished sustained currents (signals) able to activate metaboreceptors sensory nerve endings outside of small arterioles and venules of fascia surrounding muscles bundles31,32 and readily accessible to muscle produced fatigue-mediating metabolites33. 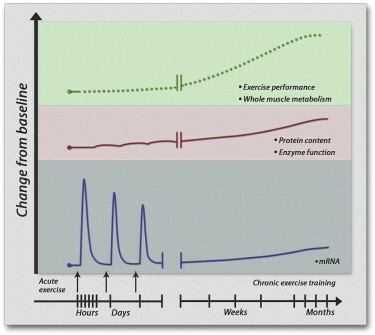 Schematic representation of changes in mRNA expression (bottom panel) and protein content (middle panel) over time as a consequence of acute exercise and chronic (repetitive) exercise training. Although each individual bout of exercise is necessary as a stimulus for adaptation, it alone is insufficient to alter the muscle training-induced phenotype. Adaptation is therefore the consequence of repetitive stimuli deriving from the sum of individual exercise bouts. An individual exercise bout elicits during recovery a rapid and transient increase in relative mRNA expression of a given gene. Several fold alterations in mRNA expression from basal levels are typical and peak at 3–12 hrs after cessation of exercise, generally returning to basal levels within 24 hr. This pattern is specific to a given gene and to the exercise challenge. Translational processing together with elevation of postexercise mRNA result in a modest, parallel boost in contractile protein content. Accumulation of repeated exercise bouts elicits the gradual increase of protein as response to the pulsed increases in mRNA expression. Thus, long-term adaptation to training is due to cumulative effects of many acute exercise bouts, leading to a new functional status. Training-induced changes in protein content or enzyme function resulting in improved exercise performance (upper panel), will impose further substrate and metabolic demands. Usually protein half-lives are much longer than those of mRNA, making changes in protein content more readily noticeable than changes in transcript expression and respectively so more in training as opposed to individual bouts of exercise. The metabolic surge of myeloid cells during the innate immunity response to intense exercise must be added to the demands of muscle contraction and compensated for, in order for such optimal resource allocation to be attained. Immunometabolic reprogramming allows myeloid cells to meet their functional demands under the conditions existing in the surrounding microenvironment, however the organism will account for this demand and sense it as a component of healthy acute fatigue. For the initial proinflammatory conditions of neutrophil recruitment, phagocytosis and NET formation) observed during intense exercise and afterwards during recovery (monocyte recruitment), glycolysis provides a rapid means for the generation of ATP and biosynthetic intermediates. Energy required for these and other functions are provided from a high rate of glycolysis35. With relatively few mitochondria, neutrophils can receive electrons from glycolysis via the glycerol-3-phosphate (G6P) shuttle into complex III in order to maintain Δψm but hardly coupled to ADP phosphorylation by action of Complex V (F1/F0-ATPase). Although less efficiently, ATP is yielded faster by glycolysis to meet the demand; a precipitous ATP production while catabolic efficiency is sacrificed. But G6P can also enter the pentose phosphate pathway (PPP), a spinoff of glycolysis that generates reducing equivalents of NADPH necessary for the microbicidal mechanisms regulated by NOX and riboses essential for nucleotide synthesis, playing also a significant role in the cellular redox status36. This ensures that neutrophils can function in an inflammatory environment where the oxygen tension may be low or even absent3738. Though the glycolytic process can also proceed aerobically36. Favorable recovery from exercise should be characterized by a prompt diminishing sense of fatigue and should not consist in more than –metabolite mediated– metabolic signaling, to prevent further dangerous energy consumption (muscle damage, rhabdomyolysis, pathological myocardium remodeling and cardiac arrythmia39, chronic fatigue, adrenal insufficiency40) beyond diminishing returns and non-adaptive energy spending41. As noted, increased resistance awareness to peripheral fatigue should be perceived with progressive training. Findings of presence of cell free DNA in plasma during recovery from acute exercise have shed more light on the unanswered aspects of the section above: What is DOMS? The source of cfDNA remains speculative, however, a rapid cfDNA accumulation due to active mechanisms seems likely rather than passive cell death events as previously suggested, however eventually ending in special forms of cell death. Neutrophils can also kill pathogens extracellularly by releasing neutrophil extracellular traps (NETs; Brinkmann et al., 2004)43. An evolutionarily highly conserved first line defense glycolytic44 mechanism of cellular transformation in which the nuclear membrane breaks down, DNA mixes with cytoplasm and the whole assemblage is jettisoned from the cell providing a key ingredient for pus and other exudates. They represent a physical structure to ensnare and immobilize bacteria and other micro-organisms in a mesh or net-like structure. Like a fly in a spider’s web, the organisms are stuck and can be further attacked by the antibacterial proteins that stud the DNA45,46,47. Interestingly, histones have anti-bacterial activity, providing another example of a nuclear molecule doing double duty for the cell, fulfilling important functions in both the intracellular and extracellular space48. The importance of NETs in microbial defense is underscored by their presence in pus. Superficial infections produce pus. For centuries, as Pisetsky (2011) pointed out in a recent review, pus with a high viscosity was regarded as “good” because it resolved the infection. Now we know that pus consists mostly of neutrophils surrounded by NETs. Molecularly, the few events that have been shown to be required, sequentially, are the production of ROS, the migration of the protease neutrophil elastase (NE) and later myeloperoxidase (MPO) from granules to the nucleus, the processing of histones, and eventually the rupture of the cell. Eventually, NETs are removed during the resolution of inflammation. The impact of NETs derives from the combined antimicrobial activities of granular components, histones, and some cytoplasmic proteins. Eosinophils and mast cells, which are granulocytes closely related to neutrophils, granulocyte homologues in lower vertebrates, and even plants release extracellular traps. NETs are the results of a unique form of cell death that morphologically is characterized by the loss of intracellular membranes before the integrity of the plasma membrane is compromised. To release NETs, activated neutrophils undergo dramatic morphological changes. Minutes after activation, they flatten and firmly attach to the substratum. After 1 hr, the nuclear envelope disaggregates into vesicles and the nucleoplasm and cytoplasm form a homogenous mass. Finally, the cells round up and seem to contract until the cell membrane ruptures and the interior of the cell is ejected into the extracellular space, forming NETs (Video). Notably, despite the intermixing of cellular compartments, during the last phase of NETosis, <30 proteins are present in NETs. Most of them originate from granules, few are from the nucleus, and cytoplasmic NET components are rare. Time-lapse recording of neutrophils undergoing NETosis. Neutrophils were stimulated with PMA, and a z stack was generated for 2 hrs and 25 min on a confocal microscope. Directly labeled antibody fragments against NE (green) and chromatin (red) in the supernatant depict formation of NETs in the final phase. In addition to their function in the defense against infection, NETs may contribute to the pathogenesis of rheumatic disease. NETs are present at sites of tissue injury in vasculitis, promote thrombosis (an important concomitant of many connective tissue diseases) and represent an important source of DNA to form immune complexes and drive type I interferon production49,50,51,52,53,54. Coagulation is a way to reduce blood loss after injury, but it also represents a primitive innate immune response that limits microbial spreading55. Coagulation is an example of how the amount of NET formation can determine a “good” or “bad” outcome. NETs participate in timely clot formation, but if present in excess they induce massive coagulation that can stop the blood supply of organs, causing severe ischemia. Acute exercise at different intensities elicits varied effects on oxidative stress, shear rate, and endothelin-1 (ET-1) that do not appear to mediate changes in endothelial function measured by artery flow-mediated dilation (FMD)56. However, an elevated cfDNA level in both non-athletes and athletes can be associated with markers of vascular endothelial dysfunction such as cytokines IL-1β, IL-6 and TNF-α, hsCRP, oxidized lipoproteins as well as reactive oxygen and nitrogen species, etc. The main source of cfDNA is apoptosis of endothelial cells and circulating endothelial progenitor cells as well as NETosis of immune cells which are programmed to move toward sites of vascular injury57. The fact that road cycling events in certain ambient conditions (hot conditions) have resulted in increased concentrations of platelet, platelet activation, coagulation, and fibrinolytic markers in both men and women it is of concern, despite that the fibrinolytic system markers also increased, which appears to balance blood hemostasis and may prevent clot formation during exercise58,59. In view of the recent findings or persistent NET formation during exercise and that hypercoagulability persists for hours and up to a day after extreme exertion60, this aspect merits further investigation and caution should be adopted when exercise must be performed under extreme conditions. the rate of deterioration and recovery of performance and discomfort (DOMS) after an athletic activity is largely dependent on the magnitude of EIMD-induced inflammatory response. it affects the frequency of training stimuli, that is, the time needed for optimal recovery in between practices, official events, and/or an event and a practice. A >20% decline of the force-generating capacity of muscles exhibits a close association with the magnitude of muscle damage and its associated inflammatory response61,62,63. Smaller reduction of muscle strength is usually not accompanied by histological evidence of EIMD64. Paulsen et al suggested that strenuous isolated eccentric activity produces a greater degree of EIMD than the so-called eccentrically biased activities such as downhill running or intense-level running. Evidence indicates that the magnitude of force, the degree of lengthening, velocity of movement, and overall volume of eccentric load are probably the most important factors dictating the rate of muscle injury in response to exercise65,66. In fact, it has been shown that EIMD induced by a football match is associated with the number of explosive types of movement that incorporate a strong eccentric component67,7. exercise-related treatments (e.g., stretching and low-intensity exercise), and numerous studies and reviews have examined their effectiveness in reducing EIMD and accelerating recovery86,87,88,89,90. Of those, massage is promising in reducing soreness but shows limited results in shortening the time needed for muscle recovery or inducing performance enhancement and lack of an observed effect on lactate clearance91,92,93,94,95. Hemmings et al. raised questions about the efficacy of massage in a study of physiological and psychological recovery stating that massage may be beneficial psychologically but not physiologically96. Nelson91 also noted that observations of massage effects were more easily shown in the psychological than the physiological domain. McGlone et al. described the neurons as, a class of low-threshold mechanosensitive C fibers that innervate the hairy skin represent the neurobiological substrate for the affective and rewarding properties of touch97. These recovery approaches aim to reduce swelling, improve blood flow, pain sensation, immune cell recruitment, and/or improve healing by activating satellite cells and anabolic factors as well as improving tendon healing. However there seems to be little scientific support towards their efficacy regarding those immediate aspects and quite uncertain is whether the more important aspects in effective and timely performance recovery/adaptation can in essence be managed. So, it results that today no general guidelines exist regarding the treatment of EIMD and performance recovery. Certain concerns have been raised regarding the use of anti-inflammatory agents based on reports suggesting that these products not only disrupt the inflammatory response but also hinder the adaptive response to training However, the periods during which anti-inflammatory agents are used need to be discerned. There are training periods during which athletes need to compete and train with very high frequency (e.g., in-season training), and cessation would be beneficial. In contrast, there are periods during which athletes train aiming for long-term adaptations, and anti-inflammatory agents may disrupt both EIMD and training adaptations. In the latter case, athletes should rethink about using such recovery approaches. This seems to have been substantiated in 24 hour ultramarathon races, where no beneficial effects were measured from anti-inflammatory agents in reducing EIMD, or DOMS. To the contrary, ibuprofen use was linked to mild endotoxemia, kidney dysfunction, and systemic inflammation98. Now it is also well-understood that athletes may be low, moderate, and high-respondents to EIMD, a fact that also explains the substantial interindividual variability in the responses seen following various types of exercise protocols used to induce muscle microinjury99,79,100,86,101,102. This phenomenon may be attributed to a number of factors such as age,103,104,105. preconditioning,106,107, gender,108,83genetics,109,110, physical conditioning level,67,111,112, and joint range of motion113. Therefore, sport practitioners should determine whether their athletes are low, moderate, or high respondents in order to establish individual normative values for each one, and should avoid absolute comparisons among athletes or generalizations. It must also be mentioned that preconditioning, a phenomenon also known as “repeated bout effect,” may protect athletes from EIMD, that is, after a first session of damaging exercise, skeletal muscle tissue adapts and is less vulnerable to injury in subsequent sessions of the same type of exercise but in a different group of muscles114,115, exhibiting less EIMD, inflammation, oxidative stress, leukocyte infiltration, and strength los76,116,114,50,117. ROS produced by leukocytes (due to activation of NADPH oxidase and enzymes such as xanthine oxidase and cyclooxygenase-2) in response to the action of cytokines released by injured muscle as well as by invading neutrophils not only offer antiseptic defense to the muscle but also result in drastic disturbance of muscle’s redox status118,119,120. ROS release during postexercise recovery may cause a secondary damage to both afflicted and healthy adjacent myofibers (due to oxidation of muscle’s protein and lipid molecules) despite a rise in muscle’s antioxidant reserves121. Reduced glutathione (GSH) is one of the main antioxidants of muscle and is used to neutralize ROS thereby producing its oxidized form (GSSG), a process that results in marked perturbation of redox status in myofibers122. It has been suggested that the GSH/GSSG couple functions as a key-controller of important redox-sensitive intracellular signaling pathways that lead to cytokine synthesis and release by the injured muscle to activate immune cell recruitment and adhesion such as nuclear transcription factor kB (NFkB) and mitogen activated protein kinases (MAPK)123. Recent evidence from Michailidis Y. et al. indicated that by attenuating the decline of GSH/GSSG following extensive muscle damage induced by eccentric exercise through administration of a potent thiol-based antioxidant, that is, N-acetylcysteine (NAC), macrophage infiltration in injured muscle, was reduced by ~30% and this response was accompanied by a blunted activation of proinflammatory cytokines and NF-kB and MAPK signaling. Supplementation of antioxidant vitamins did not affect CD4+, CD8+, naive T cells, NK cells, and proinflammatory cytokines responses following intense eccentric exercise124. In contrast, in vivo and in vitro studies have shown that alterations of GSH/GSSG status via administration of NAC may result in reduced neutrophil chemotaxis 125 and macrophage accumulation126, by attenuating the NF-κB-dependent proinflammatory cytokine expression and release127,128,129, as well as increased lymphocyte numbers and activation by inhibiting their apoptotic rate130 suggesting that immune responses in inflammatory states may be redox-dependent. However, this possibility has not been explored in humans in inflammation induced by muscle-damaging exercise. Elucidation of this possibility will shed light to the mechanisms involved in skeletal muscle trauma and aid in the development of potential treatments for diseases characterized by muscle inflammation. In this study Michailidis Y. et al. utilized NAC supplementation to enhance GSH stores during recovery from a very intense eccentric exercise protocol performed on an isokinetic dynamometer hypothesizing that NAC administration alters immune cell responses following exercise-induced muscle damage. Surprisingly, oxidative stress during 24 hour ultramarthon racing was found to be modest and not related to elevations in plasma cytokines98,131. Post-race blood leukocyte mRNA expression for IL-10 was unusually high in comparison to very low values for IL-8 reflecting the immune system’s effort to dampen inflammation. Dietary nitrate has the potential to reduce blood pressure, lower the oxygen cost of exercise, and, at least in some circumstances, enhance exercise capacity. Amongst the nutritional treatments for enhancing exercise performance, it has been studied abundantly and several points are worth to be pointed out in favor of adopting its use. With regard to the effect of nitrate on indices of exercise performance in healthy volunteers, the literature appears consistent in showing that 2–6 days (or up to 15 days) of supplementation can increase indices of performance during high-intensity constant work-rate exercise and maximal incremental exercise132,133,134. The effects of acute supplementation on performance are less consistent, with some studies showing a positive effect135,136,137,138.and others showing no effect139,140. It is likely that the efficacy of acute nitrate supplementation will depend on several factors such as the age, health, diet, and fitness/training status (including muscle fiber type proportions, capillarization, and baseline plasma [nitrite]) of the subjects tested; the intensity, duration, and nature of the exercise task; and whether the exercise is performed in normoxia or hypoxia. Acute nitrate intake may rapidly influence vascular tone and peripheral tissue oxygenation134,135, but more time may be necessary to permit changes in mitochondrial and contractile proteins to influence exercise performance141,142. Whether longer-term nitrate supplementation may support or augment (or even hinder) the physiological adaptations to training is presently unknown. The duration of continuous maximal exercise for which nitrate appears to be ergogenic is in the range of 5–30 min132,133,136,143. There is limited evidence that nitrate is beneficial for longer duration exercise (>40 min) performance, at least when administered acutely139,144. This may be related to the lower intensity of such exercise and the associated reduced likelihood of the development of local mismatching of perfusion to metabolic rate in muscle (i.e. loci that are relatively hypoxic and acidic). Whether nitrate supplementation may be ergogenic during very high-intensity continuous or intermittent exercise has not been systematically evaluated. However, two studies indicate that high-intensity intermittent exercise performance might be enhanced by nitrate supplementation143,138. The results of133 were important in demonstrating that the reduction in the whole-body oxygen cost of exercise following nitrate supplementation is consequent to changes in muscle energy metabolism. The proportional sparing of and PCr reported by133 indicated that nitrate supplementation may alter the energy (adenosine triphosphate [ATP]) cost of muscle power production. The authors suggested that this could occur by the possible effects of NO on the sarcoplasmic reticulum calcium (Ca2+) ATPase or the actin-myosin ATPase145,146. A lower ATP cost of force production would blunt the changes in intramuscular substrates and metabolites that stimulate mitochondrial respiration (e.g. PCr, ADP, Pi)147,148. and could explain the lower oxygen cost of exercise. Interestingly, the depletion of muscle PCr and the accumulation of Pi and ADP have been linked with the process of muscle fatigue during high-intensity exercise149. The blunted changes in energy substrates and metabolites might therefore help to explain the improved exercise tolerance observed following nitrate supplementation. An alternative explanation for the coincident reductions in steady-state and PCr is that nitrate supplementation simultaneously improves muscle oxygenation (thus sparing muscle PCr)150 and improves mitochondrial efficiency (thus lowering ). Evidence for positive effects of nitrate supplementation on both mitochondrial efficiency141 and muscle contractile function142 has recently been presented. Filip J Larsen at al. asked 14 healthy volunteers to consume 0.1 mmol/kg BM/day of sodium nitrate or a placebo for 3 days, after which a muscle biopsy was taken and a submaximal exercise test was completed. Following nitrate supplementation, the expression of adenine nucleotide translocase (ANT), a protein involved in mitochondrial proton conductance, was reduced, thus reducing leak respiration and improving the efficiency of oxidative phosphorylation. Nitrate supplementation resulted in a 19 % increase in the mitochondrial P/O ratio (the amount of oxygen consumed per ATP produced), which was closely correlated (r = −0.80) with the reduction in whole-body during submaximal cycling. These results indicate that the reduced during exercise following nitrate supplementation is related to a reduced leakage/slippage of protons across the inner mitochondrial membrane. The authors speculated that nitrate supplementation might result in an increased inhibition of cytochrome c oxidase by NO141,151,152 which might be sensed by the cell as mild hypoxia, initiating signaling mechanisms that result in a downregulation of ANT and improved mitochondrial efficiency. Interestingly, in contrast to 3 days of in vivo nitrate administration, the acute application of nitrite to isolated mitochondria in vitro had no acute effect on the P/O ratio. This finding suggests that several days of nitrate treatment may be required for the induction of changes in the expression of relevant mitochondrial proteins such as ANT. However, the effects of nitrate supplementation on muscle function may not be confined to the mitochondria. Hernández et al. have reported improvements in muscle Ca2+ handling and contractile function in mice fed sodium nitrate in water for 7 days compared with age-matched controls that received water without added nitrate. In particular, in fast-twitch muscle fibers, nitrate supplementation increased myoplasmic free Ca2+ concentration at stimulation frequencies from 20 to 150 Hz, effects that were related to the increased expression of calsequestrin 1 and the dihydropyridine receptor, proteins that are involved in Ca2+ handling. These striking effects on intracellular Ca2+ handling resulted in significantly increased contractile force at 50 Hz or less and a faster rate of force development at 100 Hz stimulation. There were no effects of nitrate supplementation on muscle proteins or contractile force in slow-twitch muscles. The authors concluded that dietary nitrate intake in humans may increase muscle function during normal movement. The results of Hernández et al. are consistent with the suggestion133 that the effects of nitrate on muscle efficiency may be explained, at least in part, by extramitochondrial mechanisms. In addition to evoking these intracellular effects, there is recent evidence that nitrate supplementation might also enhance blood flow to contracting muscle. Ferguson et al153 fed beetroot juice (or a water placebo) to rats for 5 days, and then measured blood pressure and hind limb muscle blood flow during submaximal treadmill running. Exercising blood pressure and blood [lactate] were significantly lower following nitrate feeding, and there was a striking (38 %) increase in muscle blood flow between nitrate-fed and placebo-fed rats. The greater muscle blood flow was directed preferentially towards hind limb muscles expressing a high fraction of type II muscle fibers. Muscle oxygen delivery was therefore substantially elevated in the low oxidative, highly fatigable fibers, such that oxygen might be considered to be more appropriately distributed across and within the active muscles. This might be expected to reduce substrate-level phosphorylation, improve metabolic control and exercise efficiency, and be advantageous to performance132. In a subsequent study, the same authors reported that microvascular oxygen pressure fell less rapidly following the onset of electrically evoked contractions of the spinotrapezius muscle of rats fed beetroot juice compared with those fed water153. This is consistent with a greater oxygen driving pressure across the transition from rest to exercise. Those studies indicate that nitrate supplementation, which may reduce both the ATP and oxygen cost of muscle contraction simultaneously increases muscle oxygen delivery. The net result is a higher ratio of oxygen delivery to oxygen utilization, which would be expected to reduce the muscle metabolic perturbation and be conducive to muscle fatigue resistance. In conclusion efficacy of nitrate might well depend on factors such as the type of subject, including age, diet, and health and fitness status; the intensity, duration, and nature of the exercise challenge; and the dose applied and duration of the nitrate supplementation regimen. The abundant research on the subject points to an organismic response to the challenges that exercise impose at the local musculoskeletal level. The approach of improving pH, redox potential and electric fields of the contractile myofibrillar units is a novel way of dealing with DOMS and in abbreviating recovery period of athletes and enhancing adaption in the longer term. Bioactil Ultra applied topically has been shown to relief DOMS in a very short period and in diminishing peripheral fatigue, while at the same time inducing a pleasant central sensation of well-being. Therefore, it is useful in managing both peripheral and central fatigue and making the return to work and daily life of athletes a common routine. Non-professional athletes then can enjoy practicing sports without interference with daily routine. In elite athletes Bioactil Ultra can accelerate and facilitate peak performance status with shorter intervals of rest between training bouts and solving any hindrance form trigger-points that might need lengthy recovery by conventional means. In overt lesions Bioactil Ultra has shown to be quite a powerful tool to resolve swelling, pain and inflammation while stimulating resolution of healing. While activation of coagulation and fibrinolysis is a constant finding in all runners post-marathon, wearing compression socks was shown to reduce fibrinolytic activity, as demonstrated by lower D-Dimer concentrations. Compression may reduce exercise-associated haemostatic activation when completing prolonged exercise154. As shown in the image above, combining the use of Bioactil (already quite satisfactory on its own) with compression socks is a good evidence-based practice that enhances rapid and safe recovery. Athletes following such method have manifested high satisfaction in speed and quality of peripheral recovery, plus a boosting and pleasent soothing central sensation during the process. Sands et al. W. Recovery and Regeneration. Vol 30. 1st ed. Berlin, Germany: Druckerei H. Heenemann GmbH & Co. KG ; 2015. Ganter et al. U. Dual control of C-reactive protein gene expression by interleukin-1 and interleukin-6. EMBO. 1989;8(12):3773-3779. 10.1002/j.1460-2075.1989.tb08554.x” target=”_blank” rel=”noopener noreferrer”>https://onlinelibrary.wiley.com/doi/pdf/10.1002/j.1460-2075.1989.tb08554.x. Paulsen et al. G. Leucocytes, Cytokines and Satellite Cells: What Role Do They Play in Muscle Damage and Regeneration Following Eccentric Exercise. PDF; 2012:42-97. http://eir-isei.de/2012/eir-2012-042-article.pdf. BISHOP et al. PA. RECOVERY FROM TRAINING: A BRIEF REVIEW. Journal of Strength and Conditioning Research. 2008;22(3):1015-1024. http://citeseerx.ist.psu.edu/viewdoc/download?doi=10.1.1.473.3392&rep=rep1&type=pdf. Connolly et al. DAJ. Treatment and Prevention of Delayed Onset Muscle Soreness. J Strength Cond Res. 2003;17(1):197-208. https://pdfs.semanticscholar.org/7f5a/ea96102e669ec292f9d9114d556d6f928382.pdf. Cheung et al. K. Delayed Onset Muscle SorenessTreatment Strategies and Performance Factors. Sports Med. 2003;33(2):145-134. https://www.researchgate.net/publication/8075169_Delayed_onset_muscle_soreness_Treatment_strategies_and_performance_factors. Peake et al. J. Characterization of inflammatory responses to eccentric exercise in humans. EIR. 2005;11:64-85. http://ro.ecu.edu.au/cgi/viewcontent.cgi?article=3979&context=ecuworks. Brown et al. GC. Nanomolar concentrations of nitric oxide reversibly inhibit synaptosomal respiration by competing with oxygen at cytochrome oxidase . FEBS. 1994;356:295-298. 10.1016/0014-5793%2894%2901290-3″ target=”_blank” rel=”noopener noreferrer”>https://febs.onlinelibrary.wiley.com/doi/epdf/10.1016/0014-5793%2894%2901290-3. Cleeter et al. NWJ. Reversible inhibition of cytochrome c oxidase, the terminal enzyme of the mitochondrial respiratory chain, by nitric oxide. FEBS. 1994;345:50-54. 10.1016/0014-5793%2894%2901290-3″ target=”_blank” rel=”noopener noreferrer”>https://febs.onlinelibrary.wiley.com/doi/epdf/10.1016/0014-5793%2894%2901290-3.